Rocket Matter Knowledge Base Rocket Project Management (NEW! )How to apply a Workflow Status to an existing matter. 1. Navigate to the matter dashboard of the matter you'd like to apply the matter type and matter status for. 2. While on your matter dashboard, click 'Edit Matter'. 3. Choose your 'Matter Type' and the 'Matter Status' you'd like the case to begin with. Note, if you do not see any status auto populate under workflow status, make sure you've started your transition for this matter type correctly. You must have the initial transition be 'No Status' to a transition of your choice. For additional help please see "How to define workflow transitions" FAQ. 4. Scroll to the bottom of your page and click 'Save Matter'. 5. 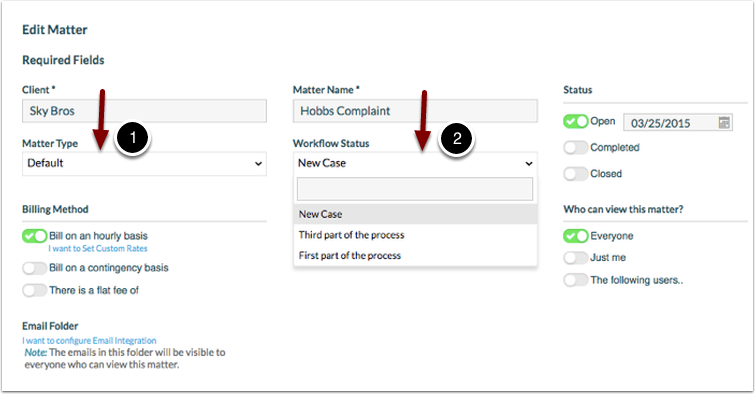 Notice your Matter Workflow Status to the right on your matter dashboard. Prev: How to define Workflow Transitions. Next: How to apply a Workflow Status to new matter.